The HAND BASIN is CALLAHEAD's versatile stand-alone handwashing system which is the perfect solution for smaller job sites or special events. No matter how small your job or event, regulatory enforcement may require you to have handwashing capabilities even if you don't have running water available. 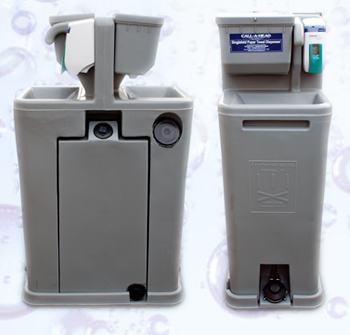 The HAND BASIN system offers all the features necessary for sanitary handwashing in a compact unit for those smaller jobs and events, or when limited space is available. Its lightweight but rugged construction makes this unit durable to handle tough jobs while still being easily transported to fit smaller spaces. 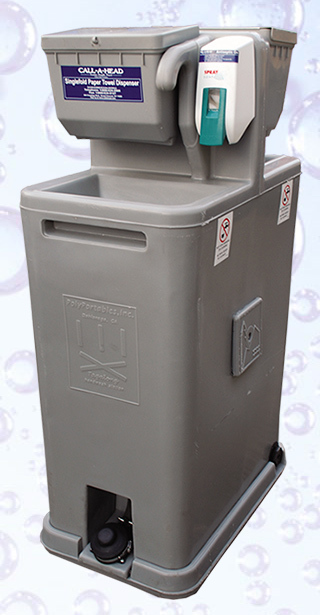 The HAND BASIN has a 24 gallon fresh water tank and a gray water tank, ideal to suit small jobs. Each water tank is hard sided so there is absolutely no risk of bags or bladders that can break or leak offering you peace of mind from contamination. The HAND BASIN's fresh water compartment is also easily removed for regular sanitizing. CALLAHEAD's HAND BASIN is simple to use with a foot pedal to fit even a heavy work boot that releases a steady stream of water with sufficient space to wash your entire forearm. Equipped with high capacity spray soap dispensers and two double fold towel lockable dispensers, the HAND BASIN will provide all of the necessary amenities for perfect hand sanitizing. CALLAHEAD understands that our customers' requests change regularly and adding the HAND BASIN to our already large variety of sink options guarantees your portable sink requirements can be fulfilled. It is our wide variety of quality products and superior service that makes CALLAHEAD the leader in the portable sanitation industry. Inserting or removing contact lenses. "Handwashing" is a critical element in proper hygiene as germs can stay alive on hands for up to 3 hours. No waterlines needed for fresh clean water.